They are not often considered important, but socks are an essential part of your outfit. Socks can make or break your outfit. 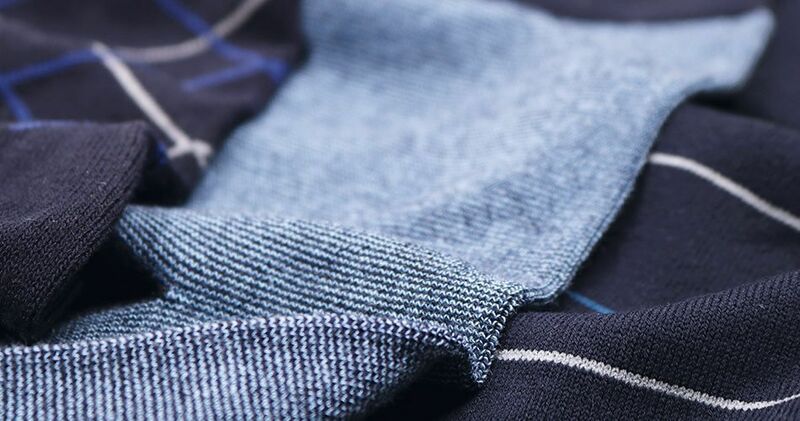 The easiest and safest way to choose your socks is by matching them to the colour of your trousers. Playing it safe? Choose a pair in the same colour as your trousers or just a touch lighter or darker. In business wear, the legs of your trousers are often shorter than those of your jeans. This means your socks will be more noticeable. Why should you match your socks with your trousers rather than your shoes? This is not only an unwritten rule, there is also a practical reason. If you sit down or if your trouser legs are rolled up, your calf might be visible. Socks in the same colour as your trousers can provide an optical extension of your legs in such situations, which creates a more harmonious and peaceful look. The classic diamond never goes out of fashion. Especially stylish with a dress shoe. Stripes, stripes and even more stripes. This striped sock is perfect with jeans. Because you can never have enough stripes. This subtle stripe suits every casual outfit but can also be worn with a suit. Do you prefer plain socks? You can view all our socks in the webshop.